Onnline hematite gemstone jewelry store wholesale supply low cost hematite magnetic and non-magnetic jewelry feature a perfect blend of magnetic therapy power and trendy fashion jewelry design. 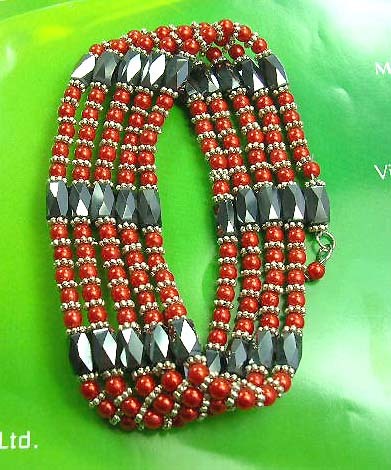 Our wholesale hematite jewelry collection include hematite necklaces, hematite bracelets, magnetic lariats which can be worn as bracelets, anklets, chokers or necklaces. Hematite jewelry are unique handcrafted jewelry and gifts made of natural semi precious gem stones and are fitting for any occasion. This multi-functional magnetic wrap hematite in combination of different shapes of gemstone beads. The bali and silver beads enhance the unique hematite design. Show your passion and love through this beautiful hematite wrap.